On February 5, 2013, victims from all across America will be presenting overwhelming evidence of judicial corruption and government corruption to the United States Congress. This interactive disc contains links to this evidence. You will never be asked to review anything that is more important to America! For 217 days, I traveled over 30,000 miles filming victims of judicial and government corruption. I drove to DC and to the capitals of each of the 48 states in the continental United States. Then I hopped on an airplane. I filmed people from every state, people who have been harmed by judicial corruption and government corruption. Upon compiling over 1,000 hours of video testimonials from over 750 ordinary citizens from all across the United States, the Lawless America project provides overwhelming evidence that the Constitution and laws written by the Legislative Branch are being disregarded by the Judicial Branch of government. This rampant disregard for the laws is captured in the video testimonials from every state in the nation. On February 5, 2013, hundreds of victims and advocates set appointments with their members of the House and Senate to hand-deliver a disc containing Congressional Testimony from victims as well as proposed legislation to reform the legal system and the judiciary. This disc gives you access to this testimony and much more. Much more, because Lawless America now has over 4,000 victims who have asked to be filmed. As Lawless America films hundreds and thousands of others, this disc has links that will take you to pages on www.LawlessAmerica.com where the new videos will be added. We aren’t just complaining. Lawless America comes to you with comprehensive legislative proposals that will reform the judiciary and the legal system and return fundamental rights to every American. Some of this legislation is appropriate at the federal level, and some is for the states. Rather than take the position that you have no jurisdiction with the state, that isn’t the issue. You are a senior elected official from your state, and these problems that have all but destroyed America require tour intervention at the state level as well. A documentary film titled Lawless America is being produced from the filming. Discussions are also underway that could lead to a weekly Lawless America network television show. 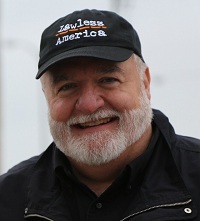 Lawless America asks: Can 750 Nobodies save America? That's the goal of this project. We have lost what our founding fathers established for us. We have lost our fundamental rights. 750 nobodies and their families and friends have set out to save America. No guns, no violence, just a Jeep, cameras, microphones, and 750 everyday people telling their stories. We have not yet written the ending of the movie. We hope it will end with this Congress saving America. This disc is easy to use. Simply click on the links below that are most important to you.